And time to reflect upon the year that is passing and our hope for the coming year. It is also time to wonder about, well, how am I going to incorporate lucky food into the new year! 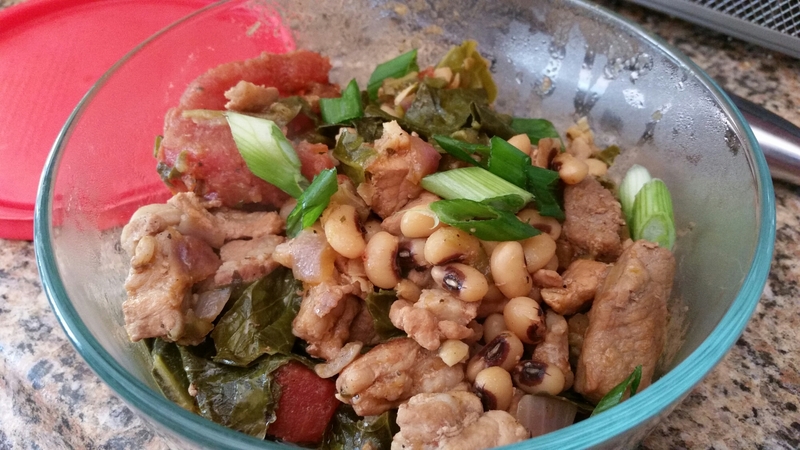 I always thought you were supposed to eat black-eyed peas and collard greens for good luck on New Year’s Day. My husband has informed me that EVERYONE else in the world is eating their lucky meals on New Year’s Eve. I have to admit that he is luckier than I, so we’ll go with his idea. He wants prime rib for tomorrow and I was going to make some sort of side dish with black-eyed peas, so now I’ll just make a main dish! I found a few recipes I liked on the internet, of all places. I especially liked the looks of one in the New York Times, so I have adapted that one here. My husband does not like smoked ham hocks much, so I bought something my local store likes to call pork fat. It is very cheap and is way more pork than fat. I just cook it to render the fat and there we go. I also like stewed tomatoes for this dish and had a can with basil, oregano, and garlic – perfect! I used a pressure cooker to make this, but you could just as easy make it in a Dutch oven, it will just take longer. 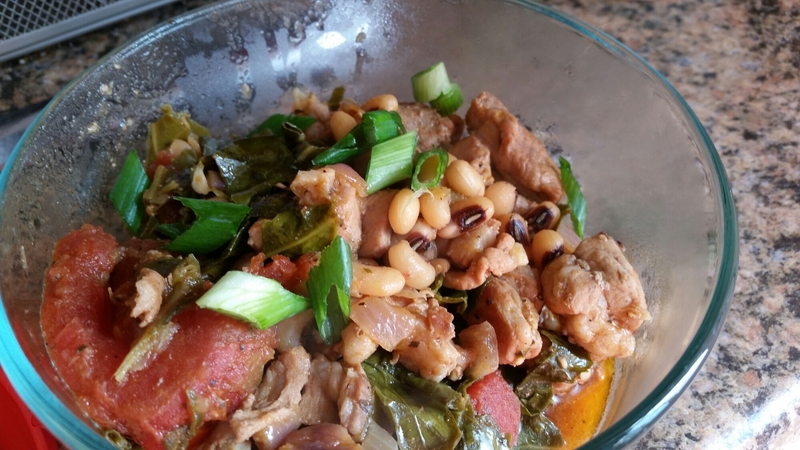 Drain the black-eyed peas and place in a pressure cooker. Cover with water so that it reaches about 2 inches above the peas. Cook about 30 minutes under pressure. Meanwhile, in a large skillet brown the pork. You may have to do this in batches. Season with salt and add the onions and continue cooking, stirring occasionally, until they begin to soften. Stir in the garlic. Turn off heat. Release the pressure from your cooker and add the pork mixture and any remaining ingredients except the green onions. Garnish, remember? You may need to add a little more water at this point. Return the pot to pressure and cook about 15 minutes or until the pork is tender to your liking. I like a little chew personally. Serve it alone or over rice according to your preference. Garnish with green onions. NOTE: If using the stove-top, you will need to simmer the beans, covered, about an hour until they are tender. Then add the remaining ingredients, except the garnish, and simmer another 1/2 hour or more until the pork is tender.